The relationship between the economies of the United States and China continues to grow in scope and complexity. While constant change is the dynamic, Chinese companies looking to do business outside of China and foreign companies seeking business opportunities in China need experienced legal counsel with substantial transactional, intellectual property and problem-solving experience on their teams. In the 40 years since Deng Xiaoping’s “reform and opening-up” policy of 1978, the Chinese government has at times opened the door wide for foreign companies to participate in its domestic economic growth. At other times, it has kept the door firmly closed. Nevertheless, China’s GDP has developed at an unprecedented rate, averaging ten percent growth per annum. However, the growth of the Chinese economy has slowed of late. In 2016, China experienced its lowest growth rate in 25 years causing alarm among observers. While some of these fears are grounded in reality, others are overblown. After decades of rapid growth and development, the Chinese economy is inevitably changing. China is transitioning to a service and consumption driven economy rather than one based purely on manufacturing and export. This transition is changing the way in which investors approach and operate in the country. In fact, between January and November 2016, foreign investment in China exceeded US$110 billion, a growth of nearly 34 percent year-on-year. Whether one is optimistic or pessimistic about the current dynamics, China’s $10 trillion economy is a never-before-seen force reshaping our global economy. And regardless of the geopolitical dynamics, the imperative to secure supply and export chains to fund the relentless desire to continually upgrade its urbanizing lifestyle, often through investments, construction, licensing and joint venture relationships, and business acquisitions, will be a constant. A nimble, cost-efficient China practice such as ours is prepared to be of service to Chinese and non-Chinese clients that wish to participate in this stream of activity in all parts of the world. A significant part of China’s economic growth comes from manufacturing. It has been the factory of the world. Its products and increasingly, services, are exported all over the world. When Chinese companies are doing business in the U.S., they face increasing litigation and/or federal and state administrative investigations relating to product quality, intellectual property infringement, contract disputes and even corporate governance. As Chinese companies mature, more and more are establishing presence or going public in the U.S., thus facing U.S. government scrutiny and other types of litigation. In the past decade, Chinese companies have built up their presence in the U.S. through outbound investment, establishing subsidiaries, acquiring intellectual property or technology assets, investing in different industries, even acquiring large U.S. companies. Chinese outbound investment hit a record high in 2016. Chinese investments into the US alone surged 359% in 2016. According to Mergermarket, Chinese companies invested $53.9 billion in the U.S. via 75 deals during the year (as of Dec. 12). Compare that to 2015 when Chinese investments in the U.S. totaled $11.7 billion. However, concerned by the surge in overseas acquisitions -- with some companies buying assets completely unrelated to their core business -- Chinese authorities have tightened capital controls to stabilize the currency. Regulators have also asked the China Banking Regulatory Commission to assess how much risk Chinese banks are facing after lending to certain Chinese companies making acquisitions. In November 2017, China's State Council issued a statement pledging to strengthen oversight of offshore investments by state-owned companies. Government agencies have been ordered to scrutinize deals and investments by both state-run and private companies. While this may slow down the overseas investment in the short term, we believe the trend of China investing internationally will not change. 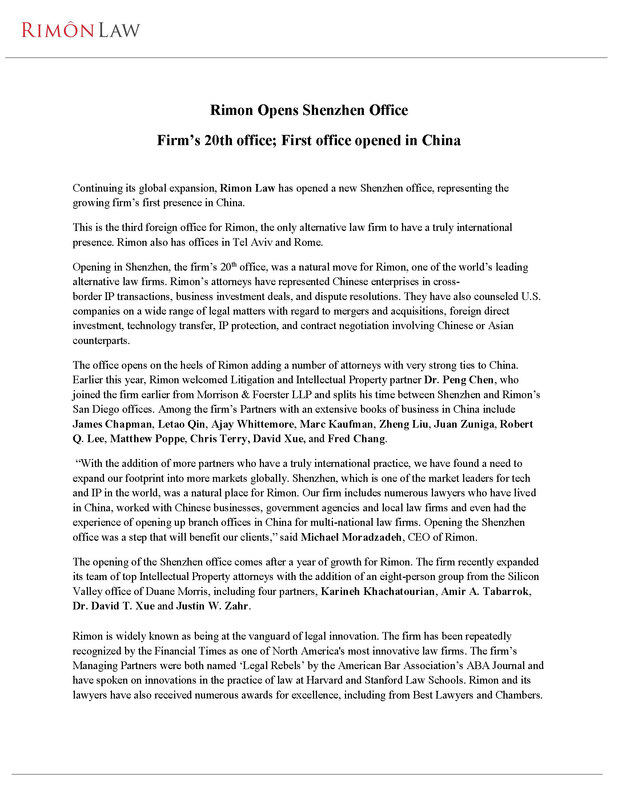 Rimon’s China Practice Group has represented many Chinese enterprises in cross-border IP transactions, business investment deals, and dispute resolutions. We have also counseled U.S. companies on a wide range of legal matters with regard to mergers and acquisitions, foreign direct investment, technology transfer, IP protection, and contract negotiation involving Chinese or Asian counterparts. Members of the group are all highly seasoned practitioners, with deep US as well as China experience, who take a “hands-on” approach and are able to counsel boards and senior management at an “enterprise” level of analysis, taking into account political, market, corporate strategy, and tax, legal and regulatory angles, to a given cross-border matter. China, as the world’s second largest economy, presents valuable opportunities to the rest of the world. The Chinese economy is driven by unique market forces that are almost unparalleled in other market-based economies. Rimon’s China Practice Group consists of lawyers who have lived in China, worked with Chinese businesses for many years and have opened branch offices in China for multi-national law firms. These lawyers spend significant time in Asia with their Chinese and other Asian clients, helping them brainstorm, negotiate, and conclude business transactions and dispute resolution involving both the US, as well as China and other jurisdictions. We are conversant with the Chinese culture, business practices and language. We have collaborated with Chinese companies, government agencies, and local law firms, and are familiar with the law, legal system, and business environment of China. We know that in most cross-border matters, the essence of success lies in, first, identifying, and second, bridging, the variations in interpretation, legal and tax outcomes, and corporate strategy that exist on each side, so that matters can close or settle with the requisite level of “meeting of minds”. We believe that deep experience and core skills are as or more important than trying to throw huge resources at any given matter, especially with the rapid changes in circumstances that attend today’s deal and dispute environments. To Chinese companies seeking to invest, acquire, or expand in the U.S., Israel, Russia, Europe, North and Latin America, or the Caribbean, Rimon’s attorneys can provide critical guidance and advice. With 19 offices spanning four continents, Rimon is truly a global law firm. Rimon’s International Desks have the experience and network to help Chinese companies to clear legal hurdles and navigate regulatory systems in any major market. Rimon’s China Practice Group advises both U.S. and Chinese clients regarding legal matters related to real estate, private equity, and venture capital investments, infrastructural projects, corporate restructurings and reorganizations, and public and private mergers and acquisitions throughout the world. Rimon lawyers have represented Fortune 50 companies in connection with their investment and technology transfer to Chinese or Asia-based companies. Rimon lawyers have also assisted Chinese companies in legal matters related to securities offering, corporate governance, equity financing, and regulatory compliance in the United States and elsewhere. We have also represented numerous non-Chinese Asian institutions in their China-related matters. Rimon’s IP team includes IAM top 300 IP strategists and seasoned patent attorneys having years of patent drafting, prosecuting and dispute resolution experience. Rimon’s IP attorneys have counseled Chinese companies on IP protection and infringement issues before entering the U.S. market, and have worked with Chinese companies looking to acquire or license patents, trade secrets, trademarks or copyrightsfrom U.S. companies. Rimon attorneys have also worked with Chinese companies in their various technology transaction with international companies in industries such as semiconductor, internet, consumer electronics, energy, fintech, and life sciences, working on many different types of agreements. In view of China’s rapid rise as a strong player in the IP protection field, Rimon’s IP attorneys can also help U.S. companies to protect and leverage their IP assets in China through patents, trademarks, trademark prosecution and trademark dispute, licensing agreements, portfolio management and business contracts. Rimon lawyers have also represented U.S. companies in negotiation of OEM and manufacturing agreements with Chinese companies. Rimon’s IP litigation team has represented many Asia-based clients in a variety of cases including IP (patent and trademark) infringement, misappropriation of trade secrets, copyright disputes, and commercial disputes. Rimon’s litigation team has the resources, experience, and local connections required to handle cross-border investigations and litigations relating to China and other Asian countries.